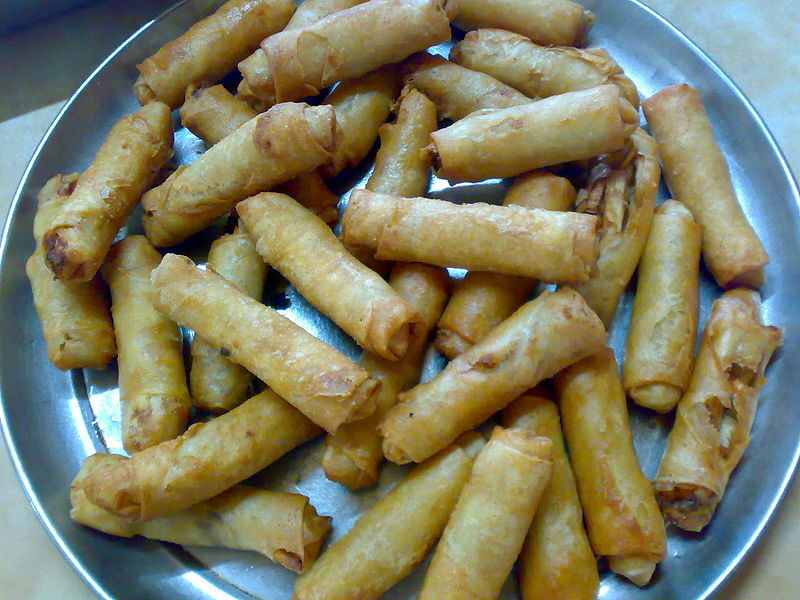 Lumpia are pastries of Chinese origin similar to spring rolls popular in the Philippines and Indonesia. The recipe, both fried and fresh versions, was brought by the Chinese immigrants from the Fujian province of China to Southeast Asia and became popular where they settled in the Philippines and Indonesia. 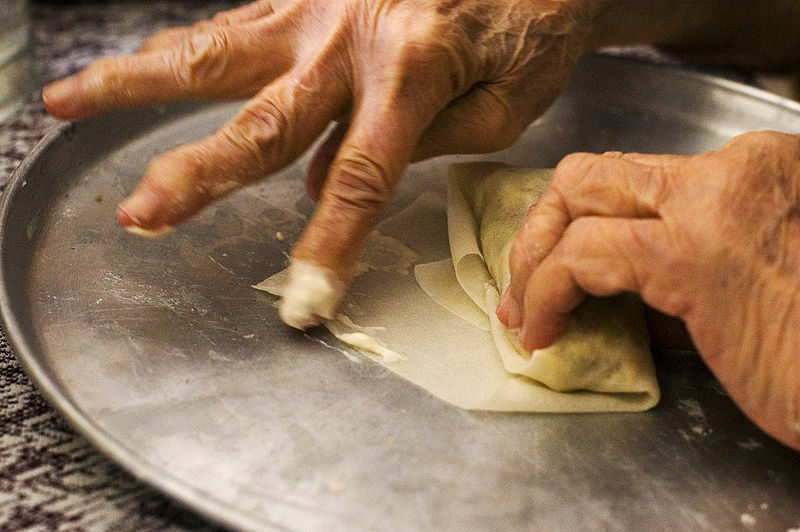 Left: Lumpia being prepared for frying. In the Netherlands and Flanders, it is spelled loempia which is the old Indonesian spelling for lumpia and has also become the generic name for "spring roll" in Dutch. A variant is the Vietnamese lumpia, wrapped in a thinner piece of pastry, in a size close to a spring roll though the wrapping closes the ends off completely, which is typical for lumpia. Lumpia has such enduring popularity that one can see at least one variant in almost any set of Filipino or Indonesian festivities. Its distinct taste and ease of preparation has caused it to be one of the staple food products on the menus of many Filipino restaurants in the United States. One of the most common types of Indonesian lumpia is Lumpia Semarang. Named after the capital city of Central Java in Indonesia, Semarang, this was created by Chinese immigrants in that city. This lumpia is filled with bamboo shoots, dried shrimp, chicken and/or prawn. It is served with a sauce that is made from dried shrimp (optional), coconut sugar, red chili peppers, bird's eye chili peppers, ground white pepper, tapioca starch, water, and baby shallots. 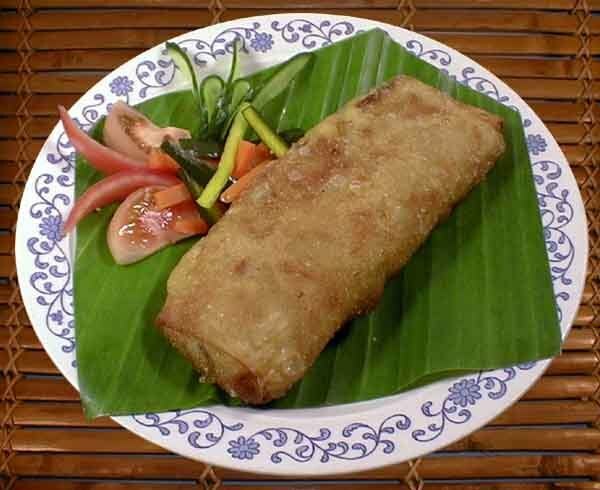 This lumpia can be served either deep-fried or unfried, as the filling is already pre-cooked.